Following the success of their BAFTA-winning series The Killing and Borgen, and the newly BAFTA-nominated series The Bridge, Arrow Film's Nordic Noir label are pleased to announce the release of Unit One: Series Three. Based on actual, real-life Danish crimes which have occurred across the last 2 decades, the International Emmy award-winning Unit One is one of the hardest hitting of the Scandi-crime series. It follows an elite mobile police force, referred to as a flying squad, as they are dispatched to assist local police in solving some of the most complex and high profile cases Denmark has ever bore witness to. Exhilarating and fast-paced, the series follow the fascinating and dangerous world of the Unit One squad as they immerse themselves in the Danish underworld. Prepare to be thrilled by their commitment and affectionate solidarity, yet puzzled by the often horrifying examples of human nature they face in their day-to-day work. Unit One asks many questions of the heroes and heroines portrayed in the show, such as what happens to those in real life who have chosen a career such as the ones portrayed in the series? A member of the flying squad is away from home 230 days a year, can a marriage and a family cope with that? What qualifications? What dedication? What kind of team spirit do these men and women possess in order to achieve one of the highest success rates in the world? Starring alongside Mads Mikkelsen (Hannibal, The Hunt, Casino Royale, Pusher), who won the Best Actor Award at the 2012 Cannes Film Festival, are some of Denmark’s brightest and best-loved actors, as seen on UK screens in The Killing, Borgen and Wallander. 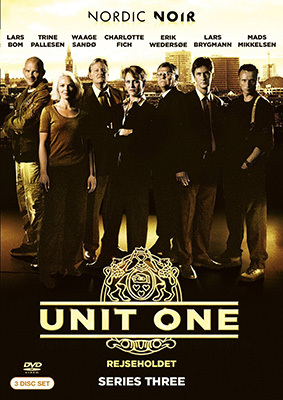 Unit One: Series Three will be release on UK DVD on 6 January 2014 by Arrow Films as part of their Nordic Noir strand as a 3-disc set at the RRP of £39.99.